Natalie Standiford used to be an editor at Random House, before she became an author. She is the author of How to Say Goodbye in Robot, Confessions of The Sullivan, and several other books. Natalie is part of the all-YA-author-band called Tiger Beat. She lives in New York City, and she can be found on her website at www.nataliestandiford.com. I'm the oldest of four: I have one sister and two brothers, and I love having siblings. It fascinates me how people with the same parents and upbringing can turn out so different, and yet there's always a thread of similarity running through somewhere. A sibling relationship is unlike any other. As a child I loved reading books about big families and I used to write stories about a family of seven sisters. My favorite part was naming all the girls, first names and middle names (andpets, for maximum naming fun). At night I told these stories to my own sister (we shared a room). She's only a year younger than I am and has always been my best friend. As kids we played endless games of cards, danced to songs on the radio, gossiped about boys. We're alike and we're not alike. You can tell that we're sisters, even thou gh she's tall and brunette and I'm short and blonde, even though she's a science whiz and I love language. Puzzling out the family traits in all their incarnations is part of the fun of having siblings. With one of my brothers (two years younger) I share a love of books, movies, music, radio, and a sense of the strange. My other brother was the baby, born when I was eight. My sister and I dressed him up like a doll in our old ballet costumes, taught him dance routines and French phrases, and put on shows starring him. Poor boy! But he didn't seem to mind, and he was so CUTE. He still has something of a performer's personality. I don't know whether that was shaped by his sisters or whether he was born with it. 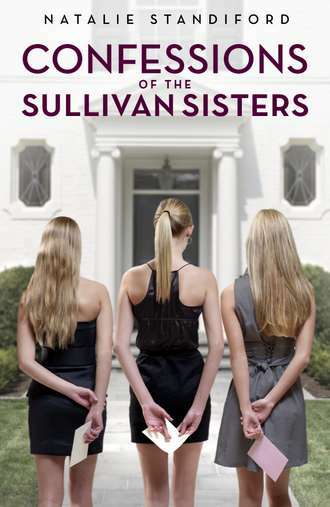 I never lost my fascination with big families full of girls, and I finally got to indulge it in CONFESSIONS OF THE SULLIVAN SISTERS. I agonized over the names of every family member, of course, and enjoyed playing out that special dynamic sisters have. They know each other so well—better than anyone else in the world—and that can foster both warmth and tension. In my experience (and in the book), the warmth always wins in the end. Scholastic was kind of enough to offer each stop a giveaway of How To Say Goodbye in Robot and Confessions of The Sullivan Sisters to one winner. The contest last until September 28th at Midnight and is for US addresses only. To enter, just fill out the form below. I agree - fantastic post! I adore my siblings (all four of them! ), and I'm always happiest when we're all together playing a game or going to a movie or goofing around in the pool together. We're different, but you can tell we're related. Natalie definitely knows what it's like!